This project will make your flat roof energy efficient and last for years to come. It get a little messy, but well worth the effort. The first thing to do is prep the roof surface. Strip any and all current roofing material off of the flat roof. You may leave any material on the sloped roof except for flashing that comes down on the flat roof. Once the roof is bare, check the roof for pitch. There should be 1/4" per foot of pitch either to the edge of the roof, or a drain in the middle of the roof. 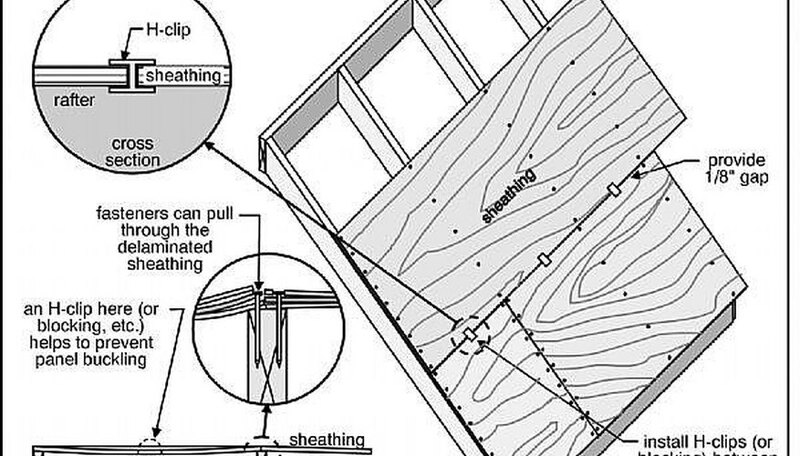 If the roof does not pitch properly, you will be able to shave and shape the foam board in order to pitch the roof properly using a utility knife and a drywall shaving block. Once you have determined your pitch, make sure the roof surface is clean and begin to lay out your 4'x8' sheets of 2" foam board insulation. 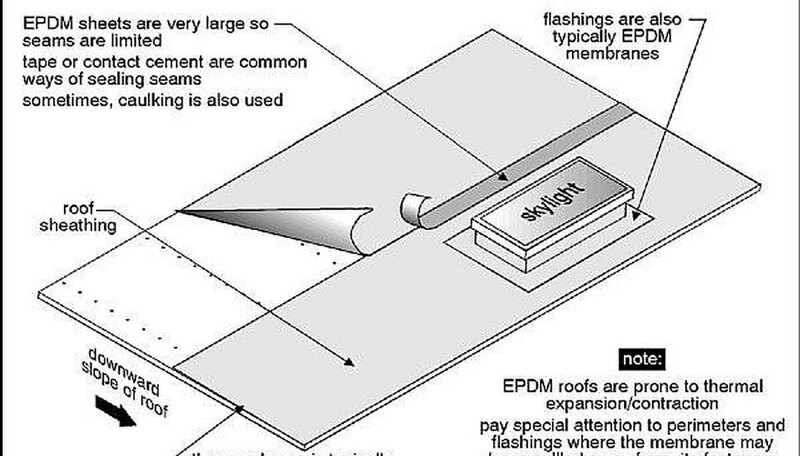 Remember that they should be staggered like roof sheathing see the diagram below. Once you have laid out the 2" foam board, check your pitches and when satisfied, take out the first corner piece and apply adhesive directly to the roof sheathing. Once tacky, lay the sheet back down and nail into place with pan head sheathing nails in the corners and through the middle. Repeat this process until all the insulation is nailed on the roof deck. Now apply a layer of tar based adhesive over half of the first two sheets of foam board you laid down and lay another foam board sheet over that perpendicular to the way you originally ran the sheets. So one full sheet will cover the two half sheets. Nail down using the same method as in Step 2 using longer nails to catch the roof sheathing. Repeat this process until you have covered the entire flat roof. 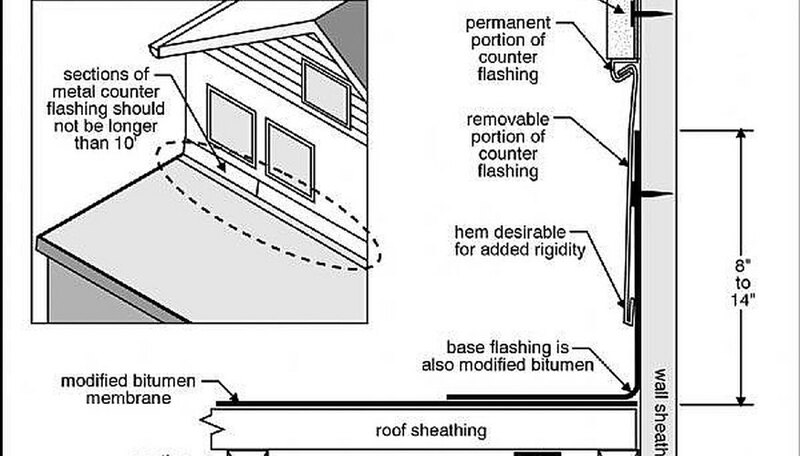 If the flat roof meets a sloped roof or sidewall, make sure that flashing is ran a minimum of 12" up the wall, under the building wrap, and under the siding and/or 24" up the roof under the tar paper and under the shingles. Always make sure the building paper goes all the way over the flashing to prevent leakage. Now you are ready to install your fascia nailer. First, measure the height of the roof surface. The fascia nailer should be EXACTLY that height. Cut boards to go around the perimeter of the roof and nail them onto the original roof fascia. If you can, run the boards all the way to the bottom of the original fascia boards. It is now time to install the rubber for the roof top. Apply adhesive starting in a 4'x4' area. Make sure to apply it thick. The adhesive will get tacky just like when applying the foam board adhesive. When the surface is tacky, start laying down the rubber membrane. The edges should go over the roof edge at least 6 inches edges. Keep applying the adhesive and slowly roll out the membrane. 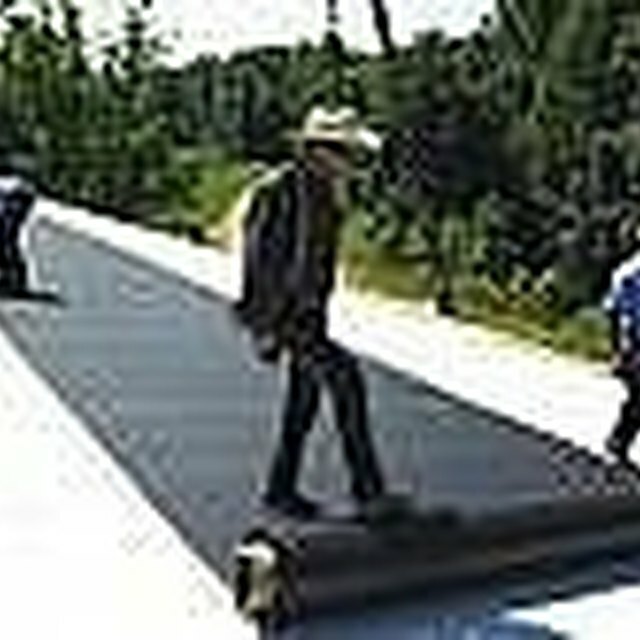 Once you have enough, one person can take the weighted roller and start rolling the previously laid sections this will prevent air bubbles. MAKE SURE THAT YOU ARE NOT LEAVING WRINKLES WHEN APPLYING. THEY WILL NOT COME OUT!!! Continue this process until the entire roof is covered. Continue rolling until after you have gone over the entire surface a second time. Now it is time to apply the seal strips and facia. Take a Take the overlapped portion of the rubber roof covering and pull it snug over the drip edge. Take the seal strip with the flange on it, and screw the strip onto the fascia board. The strip will self seal as it is screwed into place. For added protection, add a bead of mastic caulk along the strip. When screwed into place, the caulk will be pushed to the edges. This is only recommended if the strip is NOT self sealing. Now measure the distance to the bottom of the strip. Take this measurement and add 3/8" to 1/2". This is the distance the fascia goes into the flange under the seal strip. Start in the corners. Use tin snips to cut in the middle of the bottom flange that goes onto the bottom of the fascia nailer. This will allow you to bend the drip edge at that point to contour any angle perfectly. Add pieces to the ends and over lap at least 1". You may need to add some flashing to tuck under the fascia lip and go over the original fascia covering. this is a specialty bend that you would measure. Take the measurements to a tinner (generally and heating and cooling installer) and they will bend you pieces to fit. Secure the fascia covering with trim nails on the bottom flange. Congratulations! You have successfully insulated your flat roof and you have a new roof surface. If there are seams in the flat roof, seal them with adhesive. Do not use the double sided tape. It does not last. This project takes an entire day and about 3 people to do it.